As Donald Trump was sworn in on Friday as the 45th President of the United States, he promised that his administration would take the "power" of Washington, D.C. and redistribute it to the American people. "From this moment on," Trump said, "it's going to be America first." As Trump's campaign entered its final months, he promised to "drain the swamp" of the establishment elite, a group who he claimed only "protected itself." Indeed, the ever-present theme of the disenfranchisement of the American citizen from his election was strong in Friday's speech. Many voted in hopes that Trump would offer relief to the individual citizen whose voice was not heard under the establishment. Sheri Rabb is a former government worker who believes Trump will address the issues of the masses. "Things that the common everyday person wants taken care of … are going to be a priority now," she said. Rabb referred to what many feel are unfair taxes, crumbling American infrastructure and persistent issues with transportation. "We need to take care of America before we take care of any other countries," she said. Rabb and many other voters echoed a concern that Trump addressed in his inauguration speech. "The forgotten men and women of our country will be forgotten no longer," Trump said. Much of his plan focuses on making sure "every decision" is made to benefit American citizens who have been "ignored." "I'm tired of paying for other people," said Brian Wallis, a Trump supporter, who believed his taxes should go towards helping working American citizens. "Everything he says he's going to do … will help everybody." But some voters felt that Trump would not represent their interests. 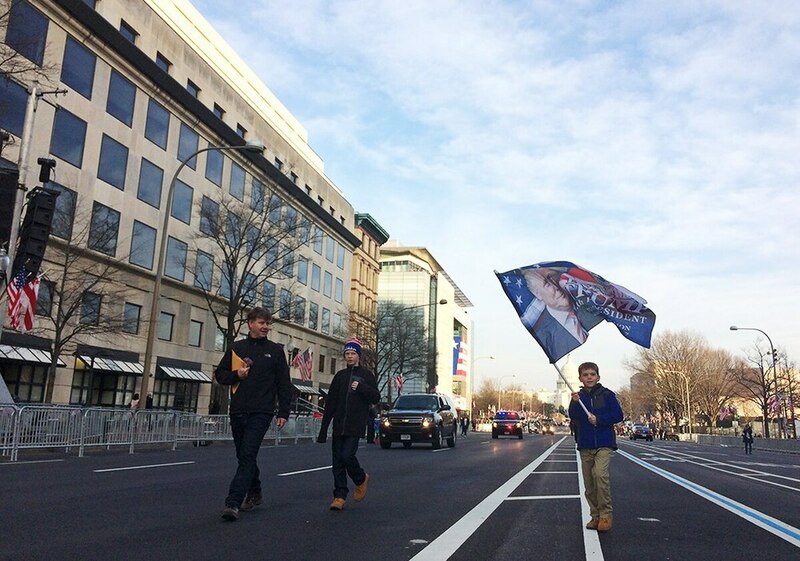 Eliot Fenton, who stood along the inauguration parade route, said that it was "incredibly insulting" for the new president to call for unity just days after insulting a civil rights leader on Twitter. "If he wants a unified country, he needs to unify people," Fenton said. "He can't talk about how he listens to America and how he hears the people's voice when he only listens to the people who voted for him." Marcy Pruett hoped the new administration change will follow up on its promise to repeal and reform Obamacare. "I used to pay hundred dollars a month, and now I'm married and we pay $1,000 a month," Pruett said. She said she believes Trump can change that. Part of the "America First" plan includes creating and keeping jobs in the country. "Buy American and hire American," Trump explained in his speech. "We must protect our borders from the ravages of other countries making our products, stealing our companies, and destroying our jobs," he said. "Protection will lead to great prosperity and strength." By protection, Trump is likely referring to a 10 percent tariff that his team discussed in December to encourage domestic production. USC political science professor Bob Shrum said, however, that "the supply chain is now globalized, so you can be a factory in Michigan … but 30 or 40 percent of your component parts are coming from China." For companies that rely on inexpensive foreign imports, tariffs may mean bad news. "You slap a 35 percent tariff on that, and your factory's gonna go out of business," he said. Tony Martin, who lives in Michigan, however, has faith that Trump's plans can save and create jobs in the U.S. He said that he and his brothers have personally been affected by job losses. "We had lost so many jobs over the years that we were just excited about someone who wanted to bring them back to us," he said. Reach News Editor Sharon Zhang here, or follow her on Twitter. Staff Reporters Lauren Day and Magali Gauthier contributed reporting from Washington, D.C., and Staff Reporter Cole Sullivan from Los Angeles.